My local Viejas Casino just installed Free Bet Blackjack, a game I worked on for Geoff Hall and ShuffleMaster. There’s a side bet on the game called “Push 22”, that I did not work on (until I got back from Viejas last night). I figured I’d check if it was you-know-what. The bet has some nice payouts, and is a natural match for a game where the dealer pushes all bets on a 22 bust. For a 6-deck shoe, the game has a 5.85% house edge. Not too bad, considering the odds it pays. With the unbalanced blah, you should blah for +24 or better. This will happen 5.1% of the time, with an average +3.6% blah. Paigow Dan told me about the new Lucky Stiff side bet his friend recently placed at the 7 Cedars Casino in WA. It looks fun, because you’re paid 5:1 when your initial 12-16 hard total ends up winning the main hand. Also, blackjack pays even-money on the side bet, and an initial pair of 8-8, 7-7, and 6-6 instantly wins 10:1. Anyways, I ran the bet through my BJ analyzer, to see if it was interesting in any way. 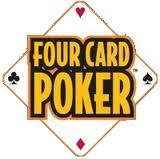 I understand that 7 Cedars lets you bet $5 on the main hand, and up to $25 on the side bet. So I ran the analysis for a 5:1 side-to-main ratio on a 6-deck, H17, SP4, SPA4 game. The return showed a house edge of 3.5% of the combined (main+side) wager. The optimal strategy for the 5:1 side-to-main ratio only has a few differences with basic strategy. This bet looks like fun. If you bet an equal main and side bet (1:1 side-to-main ratio), the house edge is 4.66% on the combined 2 unit bet (2.33% element-of-risk). That’s not too bad for a carnival-like odds. If you make a small side bet 1/5th of your main bet (e.g., a $1 side bet to a $5 main bet), then the house edge on the combined 1.2 unit bet is 1.38%. That’s not bad for a little bit of fun. I saw this blackjack side bet in the Venetian last month, and it looked pretty you-know-what. I forgot to post about it until now. I’m pretty sure they use 8-deck shoes at the Venetian. Using the unbalanced taps, the bet is +EV for RC >= +34 (assuming two decks behind the cut card). This yields 16% betting opportunities, with an average edge of +2.8%/bet. The theoretical max (using full shoe composition, including suits) is 17% opportunities @ +3.0%/bet. It’s not worth much. A reader pointed me out to Galaxy Gaming’s Bust Bonus blackjack side bet that the dealer will bust, which you make after seeing the dealer’s upcard. I figured I’d run the numbers to see if it was any good, or if it was countable. Well, it might be a fun bet on a few upcards, but it’s kind of expensive for the (offsuit) odds they offer. *Bust Bonus wagered after dealer peeks for blackjack. The most countable bet is against a dealer 8 upcard. It has the lowest house edge (4.9%), and has high payouts for the 888o and 888s busts. The EORs are large, and a simple unbalanced count (Eight => -8, Nine, Ten/Face, Ace, Deuce, Trey, Four => +1; bet when running count >= +24) yields an average +7.5% edge/bet on 17.3% of the dealer 8 upcard hands. Of course, a dealer 8 only occurs on 1/13th of the hands, so it’s not a very practical bet. An ideal count (using total shoe composition including suits) yields a theoretical max return of +7.5% edge/bet on 1.6% of the dealt hands. I ran across the Bust It blackjack side bet last weekend at the Palazzo in Las Vegas. It seemed countable, so I ran the numbers today. The bet is simple. You make the side bet before the hand begins, and if the dealer busts on 3 cards, you win according to the paytable. If the dealer doesn’t bust on 3 cards, you lose. The basic house edge for a 6-deck shoe game is -6.91%. The EORs are fairly high, as listed below. If the cut card is placed after the 5th deck, then an ideal count (using perfect shoe composition) yields 14.7% betting opportunities, with an average +6.73% advatange per bet. That’s an average return of about 1.0% per dealt hand. Practically, you’d use the unbalanced count in the table above and bet with a running count of +25 or more. This practical count yields 14.4% betting opportunities, with an average +6.1% edge per bet. That works out to an average return of +0.88% per dealt hand. Depending on the side bet limits, counting this bet could be profitable. But, more likely, they’ll limit you to a $25 max bet. So your profit rate would be (100 hands/hr)(14.4% bets/hand)(+6.1% profit/bet)($25/bet) = $22/hr. Of course, you’ll almost certainly have to make the main bet too (e.g., the Cosmopolitan wouldn’t let me make bonus bets on my friend’s blackjack hand). If it’s only $5, and you get good rules @ -0.6%, then your cost would be (100 hands/hr)($5/hand)(-0.6%) = $3/hr, leaving you with a $19/hr job. The unbalanced count is fairly complicated, with its multi-level taps. Unless your a very skilled counter, you’ll be better off using the simplified count above. It only uses +2 and -1 taps, and it still performs well, yielding 13.5% betting opportunities, with an average +5.3% edge per bet. Bet when the running count is +24 or more. Also, the standard blackjack counts don’t work for this bet (there’s no correlation, I checked). You can tell that blackjack counts are very different than this specialised count, because Aces are +3 and Sixes are -2. Those are opposite to blackjack values, and they make sense. Ace-rich shoes are bad for 3-card busts. Also, sixes are valuable because of the 15:1 payouts. Note: a reader says the Palazzo/Venetian deals out of 8-deck shoes. If that’s the case, and they place the cut card @ 6 decks, then the ideal return decreases to 10.7% frequency at an average +4.7% edge. The simplified count return decreases to 8.9% opportunities @ +3.5% edge per bet. You would bet for an RC of +32 or higher. I came across the Push Your Luck (PYL) blackjack sidebet yesterday (while browsing, not IRL), and I wondered if it was exploitable in any way. PYL is a simple side bet. You make the bet before you start your blackjack hand, and if you end up pushing your main bet, you win 10:1 on the side bet. The max bet is 1/2 your main bet, and its usually limited to $25. PYL has been out there for a while, but it’s new to me. It’s pretty simple to code up in my analyzer, which finds the optimal play for the combined (main + side) bet. I don’t know why, but I always expect these bets to be +EV, or somehow exploitable. I’m kind of optimistic that way. With a max PYL bet, the game gets a little wild where you’re hitting the majority of your under-17 hands, even against low dealer upcards. People must have a fit at this game. But it looks kind of fun, because you’re trying to get a nice 10:1 payout. It’s a good reason to play crazy. You’ll probably need the proper index plays for (not) hitting your under-17 hands on +EV counts. I looked at the strategy for a small +EV count, and the borderline decisions shift towards standard plays. If I get around to learning the lingo for index plays, I’ll post them here for PYL. I’m pretty sure anyone can tell just by looking at the paytable, but here’s the numbers anyways. Yep, it’s that bad. A true sucker bet. You might be able to fool some of the players some of the time, but you won’t be able to fool them for long. Everyone will catch on to how bad this bet is sooner or later. The Bust Me 13 sidebet gets very good rather frequently. Of course, you must have hard-13 to bet, so this +EV opportunity only occurs on about 2.6% of your hands, with an average edge of +5.4%/bet. That’s not great, but you can make a huge $500 or $1000 table limit bet, until they stop you. So you’ll get about 1.2 betting opportunities per shoe, and even if you bet $1000, you’ll only average about a $65 profit per shoe. For a 6-deck shoe game with good rules, and the correct capping strategy, the house edge for this side bet is only 2.6%. The basic strategy of when to cap your main bet with your side bet proceeds is presented below. The game is currently available at my nearby Pala Casino, the Siena in Reno, and the Drift On Inn in WA. The player makes the optional side bet wager before the hand is dealt. 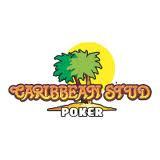 The side bet pays for the initial 2-card player hands according to the paytable below. The player has the late (after dealer peeks for BJ) option of capping his main blackjack bet with an amount up to the entire side bet proceeds. The player completes the main hand following normal blackjack rules. The table below tells you when you should cap your main bet with the winning proceeds of your side bet. “Y” means to cap the bet with the proceeds, because the EV of the hand (after the dealer peeks for BJ) is positive. “N” means not to cap the bet, but just to collect your winnings, because the post-peek EV of the hand is negative. 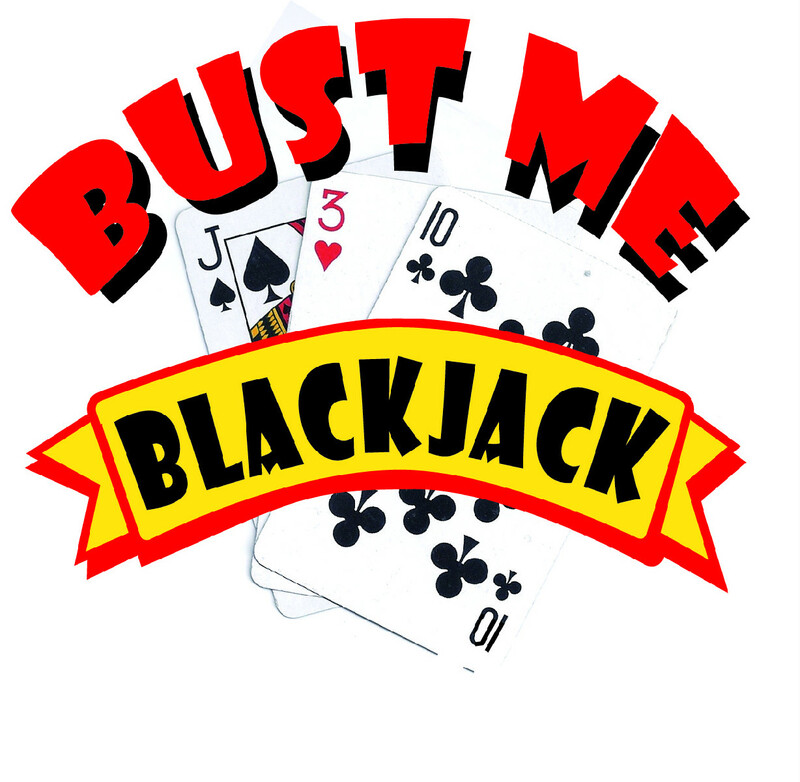 After the capping decision, play your hand according to blackjack basic strategy. This side bet is only slightly countable, using the counting coefficients (2 => +1, 3 => +1, 4 => +1, 5 => 0, 6 => 1, 7 => 1, 8 => 1, 9 => 1, T => -1, J => -1, Q => -1, K => -2, A => -2) and a true count threshold of 3.1. From a 6-deck shoe with 1 deck behind cut card, you’ll have +EV betting opportunities about 13.4% of the time, with an average edge of +3.4%/bet. So betting $25 when the count is good will yield a profit rate (13.4%)($25)(+3.4%) = $0.11/hand. At 100 hands per hour, this yields $11/hr, which isn’t worth anyone’s time or effort. Everybody thank Eliot Jacobson for working for you. He emailed me this morning telling me the Field of Gold blackjack side bet was crushable. And it is. For real. The count is simple, and for a 6-deck shoe game, you’ll be able to bet 19% of the time, with an average edge of +6.5%/bet. That’s a profit of ($25 bet)(19% bet/hand)(+6.5% EV/bet) = $0.31/hand. For double-deck, the numbers are even better, yielding 27% betting opportunities with an average edge of +8.2%/bet. For $25 bets, that yields a profit of $0.55 per hand dealt. That adds up pretty quickly. It’s more than $100/hr. This is about as good as it gets, as it’s a fast blackjack game. Oh, by the way, Eliot also brought you the equally crushable Lucky Lucky bet, which I probably understated in my post. These are probably the best two countable side bets out there, and nobody but Eliot has noticed them. Oh, and he’s the one that pointed out the Dragon-7 vulnerability. Bet when the true count (= runningCount/decksRemaining) is 2.2 or better. 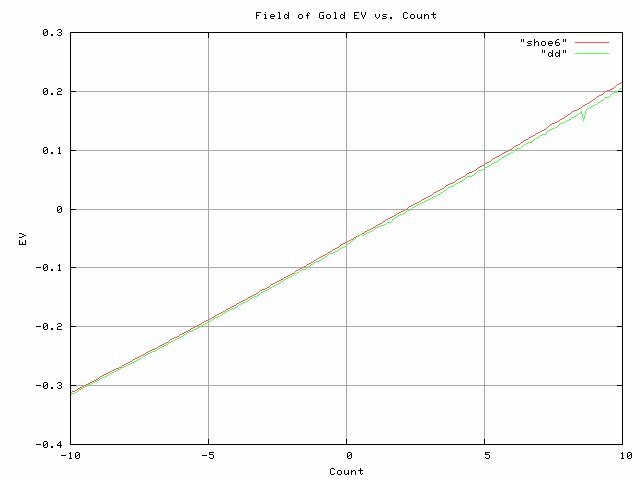 You can see from the graph below that the EV is strongly correlated with the true count. This side bet becomes highly profitable when the shoe is rich in aces and deuces, and lean in high cards. During some shoes, the deck can easily get really good, or really bad for the Field of Gold bet. The distribution of the side bet EV is plotted below over the course of the 6-deck shoe and the double-deck game. Note the peak of the distribution is centered about the nominal -5.66% return of the bet right after the shuffle. Then, especially towards the end of the shoe, the side bet return can vary wildly. 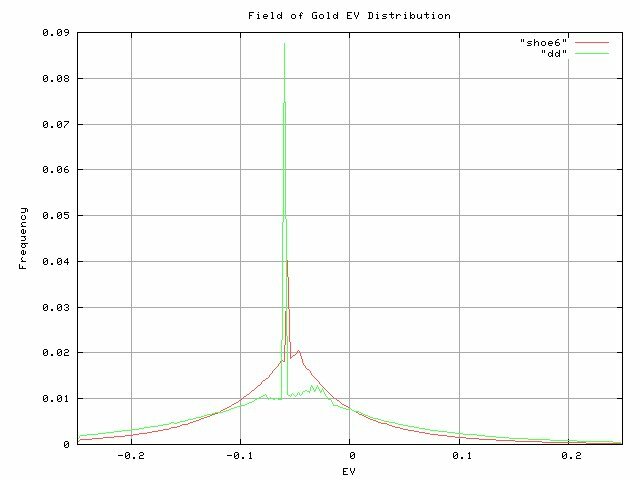 Note all the area under the long tail of the distributions to the right of the y-axis (EV>0). This is why the game is crushable. 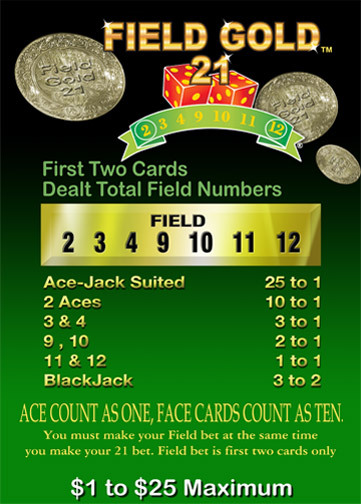 The Lucky Lucky blackjack side bet is played with your first two dealt cards, and the dealer upcard. On these three cards, you get paid for various ways to make 21, and for any 20 and 19 total. The most countable version of this side bet is for the double-deck version with the paytable below. The game is also countable for the 6 deck shoe game, but it’s only 60% as profitable. which is not a practical counting scheme, but the theoretical limit if you used a computer that took into account all info (suits, etc.). which is only 61% of the profit rate as the double-deck game.